Should B block the thrust? As outlined in Basic Instinct, the standard answer to a thrust is to block it. Why is this so? 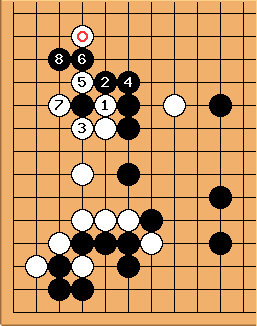 If Black gives way with , then White cuts through his position with all her stones being connected, yielding 5 liberties. Locally, considering these stones only, there is a clear advantage for White if Black does not block. connects the uncut stones and White can capture the cut off stone in a ladder, if it works. There are of course many other variations, depending on local circumstances and nearby stones. 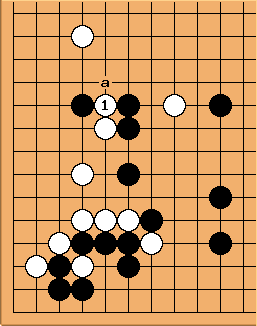 In Go games, abstract situations like the above rarely occur in isolation. Given concrete circumstances, it may be better to give way. The point of this page hence is not to stop a player from thinking about the situation, but to encourage thinking about the block first. Considering the standard answer first is efficient and, only if it leads to a clear loss, one can consider other moves. Still, amateur players will often incorrectly dismiss the standard answer, because they underestimate its virtues as described above. 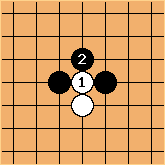 Of course, it all might depend on B' strategy, but, locally speaking, not to block is really bad move in this case. If cuts, - cut through his position, thanks to the liberty had removed from the two white stones. 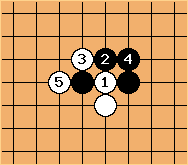 If gives way, White easily connects over the 5th line. Black does make some central territory but that should not be the aim of the acquired influence and does not compensate for White's huge profit on the left. If here, connects on the outside and White hurts the marked stone by continue her intention and cut with . Black can even consider connecting at with , depending on how strong he is. In short, the standard answer gives a lot of options to Black, using the pressure of the removed liberty. The alternative is too mild. 2 - Charles: Blocking is played 75% of the time, when I checked. Good enough: it's rarely going to be such a bad play. An answer like here is the other kind of play to consider (if one answers locally). One can't call that good shape in an unqualified way: see the related split shape. 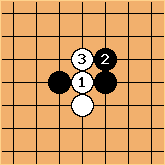 3 - Fhayashi: I think what it boils down to is that as long as you block, both black and white end up at least temporarily separated. 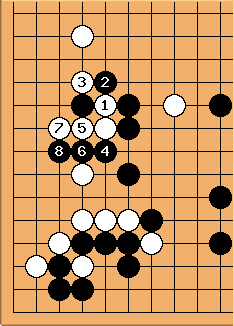 If you don't block, white is connected and black is not.